T-Guard is a novel medicine with potential for the treatment of certain life-threatening immune conditions, such as transplant-related rejection, acute solid-organ rejection and several severe autoimmune diseases. It is currently in development to treat and prevent steroid-resistant acute graft-versus-host disease (aGVHD), a life-threatening immunological condition that often develops in patients following hematopoietic stem cell transplantation. T-Guard consists of a unique combination of two toxin-conjugated monoclonal antibodies that target the CD3 and CD7 molecules on T cells and NK cells. Preclinical and early clinical testing showed that T-Guard can safely and swiftly reset the immune system in patients. T-Guard has been granted Orphan Drug Designation in both the EU and US. After injection into the body, T-Guard specifically identifies and eliminates mature T cells and NK cells, with high preference for activated T cells (the troublemakers). Each of the two antibodies in T-Guard is conjugated to an immunotoxin that prevents the activated T cells from making new proteins, thereby inducing programmed cell death (apoptosis) with minimal treatment-related side effects. T-Guard’s brief, targeted action appears to limit the patient’s vulnerability to opportunistic infection whereas the commonly applied broad immunosuppression exacerbates this complication. An immunotoxin consists of a specific cell-targeting component, typically a monoclonal antibody (mAb) that is linked to a cell-killing toxin. In T-Guard, the toxin is Ricin Toxin A (RTA) - the A-chain form of the potent plant toxin, Ricin. The mechanism of action of immunotoxins resembles that of the Trojan Horse (Figure 1). The mAb specifically binds to its target cell, after which the entire immunotoxin is internalized within the cell. Once inside the cell, the RTA toxin disengages from the mAb and kills the cell by irreversibly inhibiting the protein synthesis machinery that is vital for all cell functions. Since the RTA toxin used in the construction of T-Guard is incapable of entering the cell autonomously, only cells that are recognized by the mAbs will be killed. Based on their ability to specifically target distinct cell populations, immunotoxins may be well suited to treating GVHD by eliminating donor-derived T cells that are responsible for the disease. T-Guard is preparing to enter Phase 3 clinical development for this indication. The monoclonal antibody (mAb) selectively binds to its target cell (1). Following the subsequent uptake of the immunotoxin (2), the toxin dissociates from the mAb and kills the cell by inhibiting protein synthesis (3). The particular combination of immunotoxins used to construct T-Guard blends synergistic cytotoxicity and narrow specificity via multiple gentle mechanisms of action. Although the principle behind immunotoxins as described above is not new, the particular combination of the two immunotoxins selected for T-Guard offer compelling differentiating features. The combination of half a dose of the anti-CD3 and anti-CD7 immunotoxins in T-Guard has been shown in pre-clinical testing to be more effective in eliminating T cells than a full dose of either immunotoxin alone. Simultaneous targeting via two distinct antigens appears to reduce the chance of T cells escaping treatment. Equally importantly, dividing the toxic payload over two different immunotoxins appears to reduce side effects. These features seem to increase the therapeutic window for T-Guard as compared to other immunotoxins using the same toxic payload and that have been clinically tested as individual compounds. Both the anti-CD3 and anti-CD7 mAbs deliver the RTA toxin to the inside of T cells, resulting in the elimination of these cells by protein synthesis inhibition (Figure 1). 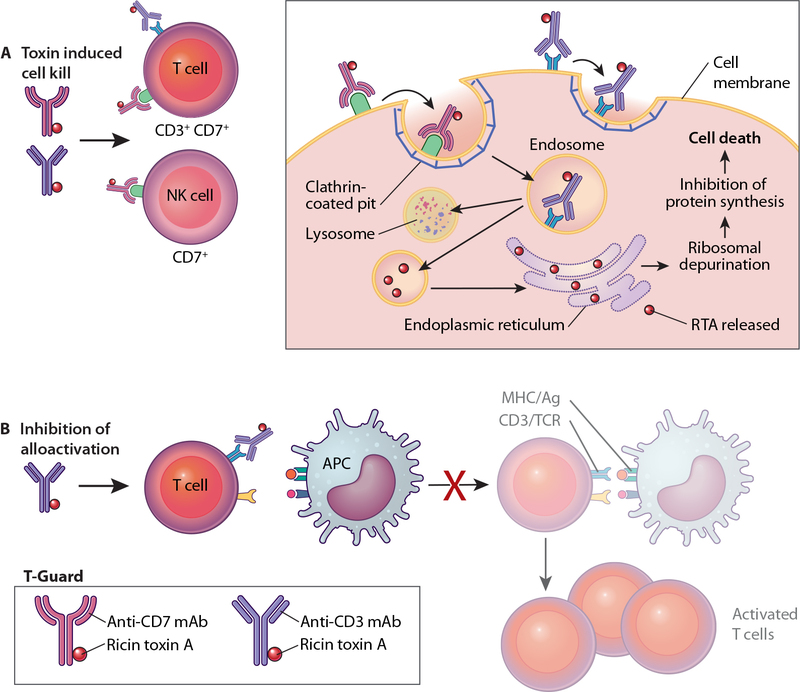 Additionally, the binding of the anti-CD3 mAb to the T cell receptor/CD3 complex (TCR/CD3) results in an immunosuppressive effect through modulation/blocking of the TRC/CD3 and by activation-induced cell death (AICD). Both of these mechanisms enable a ‘gentle’ (non-inflammatory) elimination of T cells through apoptosis. Also, the particular anti-CD3 mAb selected for T-Guard does not stimulate T cells. These characteristics significantly reduce the occurrence of cytokine release syndrome (CRS), a potentially life-threatening complication frequently associated with alternative immunosuppressants targeting the TCR/CD3. T-Guard has a narrow specificity, directed only against mature T cells and NK cells. Importantly, recently activated T cells have been shown to be about 35 times more vulnerable to T-Guard than non-activated T cells. It is thought that T-Guard may stop the pathologic immune response while generally sparing the resting T cell pool, which is able to counter future potentially dangerous infections. The elimination of NK cells is thought to be beneficial as these cells could aggravate the severity of acute GVHD through cytokine production. T-Guard is administered as four infusions in a treatment course of just one-week. Due to its short half-life - about nine hours - T-Guard is rapidly washed out after the last infusion, allowing the swift restoration of the T cell compartment with newly formed (non-disease causing) cells. Due to the above characteristics, T-Guard compares favorably to alternative therapies consisting of (monoclonal) antibodies that cause depletion of T cells and/or other immune cells, or biologics and small molecule inhibitors that induce a functional suppression of the immune system. The often prolonged and rather broad immunosuppression induced by many of these agents frequently results in infectious complications and a potential loss of the beneficial Graft-Versus-Leukemia (GVL) effect, thereby nullifying the benefits achieved by controlling the GVHD reaction. T-Guard may therefore change the treatment paradigm of severe acute GVHD in that a short and targeted course of treatment may induce lasting remissions of this debilitating disease while allowing for a swift restoration of a functional immune system.